Mobile games have been pretty big for a while, and they’ve got a variety of unique challenges and benefits. I’ve been playing a lot of them lately, so I figured I’d talk about a couple of mistakes that have been jumping out at me lately. 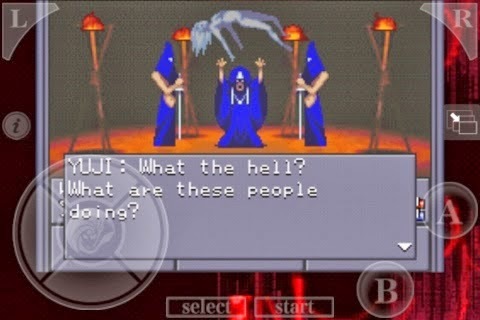 I’d like to use Shin Megami Tensei and Hay Day as examples. These are not bad games. In fact, they’re excellent examples of their respective genres. They just use some questionable control decisions. If you’re making a control scheme for a mobile game, please don’t do that thing where you superimpose a fake gamepad over the screen. Design your controls for the device your players are actually using. A gamepad control scheme works for actual gamepads because the players can actually feel the edges of the buttons. Until apps are able to cause parts of phone screens to push outward to create tactile feedback (and I’m guessing we’ll see this within 15 years), you’re just going to remind people that a gamepad would be a much better input device for the game. A more widespread problem is that fingers are going to be covering large parts of the screen, and you need to design around that. Take, for example, Hay Day. It’s doing really well for itself. It’s currently the eighth highest grossing app in iTunes. However, it’s got a bit of a problem when it comes to designing around fingers. Let’s say you want to bake a loaf of bread. To start, just tap the bakery. This brings up a little radial menu of items you can bake. If you hold your finger over the loaf of bread, you can see how many ingredients it needs and how many ingredients you have. 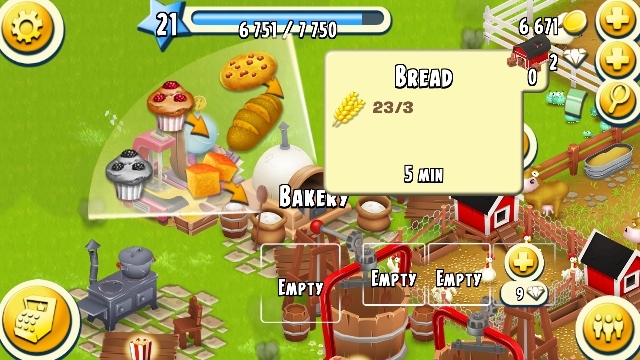 To actually make the bread, you need to drag the icon over to the queue along the bottom. It doesn’t look so bad, right? Hold on and think about this for a moment. You’re probably gripping the left and right sides of your phone. Those baked goods icons are in the center, so you can’t comfortably reach them with your thumb. Your hands shift positions a little. Let’s assume you’re right-handed. Your left hand supports the phone, and your right hand positions itself to use your index finger to touch the icon. The ingredients will only be displayed for as long as your finger is on the bread icon. Unfortunately, as long as your finger is on the bread icon, it’s also going to be over the numbers! If you want to actually see the numbers, you need to shift your head or your phone around to get a different viewing angle. This doesn’t sound like much, it does pull them out of the game a little, and over time, the little things add up. A good user interface is unobtrusive. 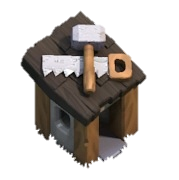 The player’s finger is now a part of the user interface. The finger should never be positioned in a way that blocks whatever the player is trying to look at. Mobile match-3 games ask you to put your finger over the screen all the time, as do plenty of other mobile games, but this never really takes you out of the experience. Let’s say you got a player to install your game. Hooray! You’ve got all sorts of hooks in place to keep them playing for weeks and months, but before the player encounters any of those, there’s a much more important retention concept you need to run through: The first time user experience. The first 15 minutes of your game need to be stellar. During this time, you need to teach the player how to play the game, convince them to come back for a second play session, and make sure they have a fun time. On top of this, you might want to do other things, like ask them to invite other friends on Facebook or associate the account with Facebook or Google Plus. The first play session is the most crucial, and I really can’t emphasize enough how important it is. Criminal Case spent 30% of its development time doing nothing but working on the first time user experience! A team of 25 people spent six months working on an experience that isn’t even an hour long! It might sound ridiculous, but Criminal Case managed to keep 9 million daily average users after just six months! You can have the greatest game in the entire world, but unless you make a fantastic first impression, that’s going to be of limited benefit. That first time user experience is crucial. Every second of that first experience needs to be carefully designed and tested over and over. You can’t get someone to play for months without getting them to play for hours. I’ve beaten every single level in Angry Birds Stella. It’s got two episodes, each containing about 70 levels. I’m going to give myself a little time to think it over a bit. I’ve also started playing League of Legends more seriously. I figure I should try to achieve a decent level of skill in at least one competitive game, and League seems to have the largest audience. Expect a return to my usual update schedule soon. 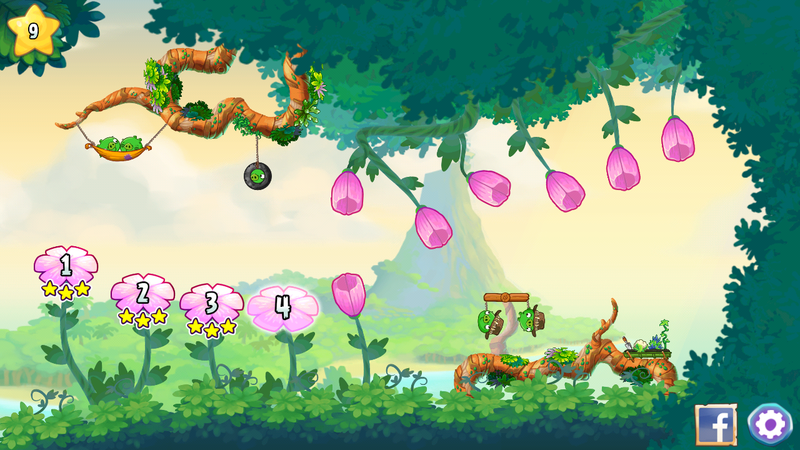 Last week, Rovio released Angry Birds Stella, the latest game in the Angry Birds family. I’m going to be talking about this a lot over the next week, but for today, let’s talk about the first thing that clearly jumps out, the thing that we can’t ignore (nor should we). 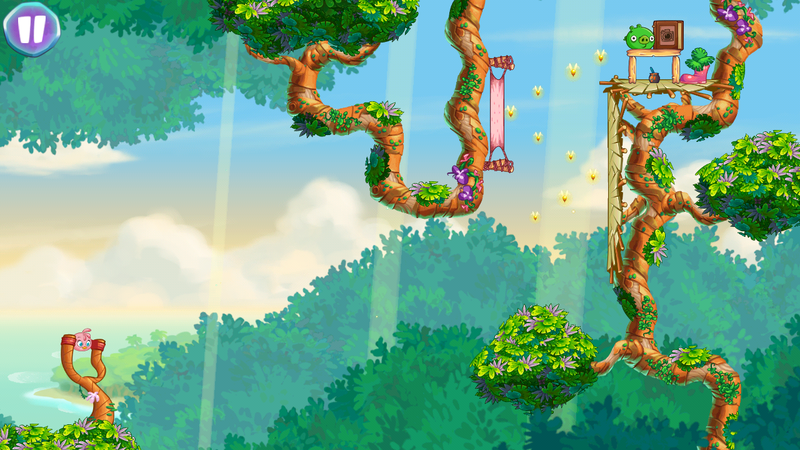 The protagonist of Angry Birds Stella is female. Her identity is core to the game’s identity. Her name, Stella (written in smooth, flowing strokes), dwarfs the Angry Birds logo (written in rough blocky lettering). On the loading/title screen, she takes up nearly a third of the screen space. The game’s icon, which represents the game to all its players, is a confident shot of her face. 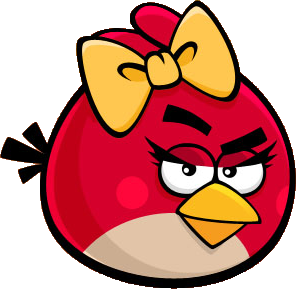 Angry Birds is enormous, and using a female protagonist in its latest game is a major step forward in an industry unfortunately dominated by a single gender and where protagonists are male by default. Stella has been placed in the spotlight, but has she been placed there responsibly? The first thing that’s bound to come up is that she’s got an awful lot of gender signifiers on her. Her name is written in pretty flowing lines. She’s got prominent eyelashes. On the app icon, one of her head-feathers is bent over her face, suggesting long hair. Also, she’s pink. I realize it might be a silly question to ask if this female protagonist is too female, and that’s not really a question I think I can answer. We live in a society where beings are assumed to be male by default. Signifiers have to be added to indicate that these characters are female. We don’t live in a world where Pac-Man needs a mustache so we understand that he’s male. 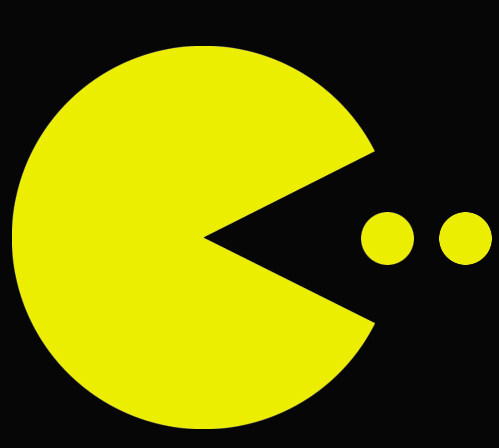 We look at Pac-Man and make a completely arbitrary assumption that he’s male. On this subject, I feel that it might have been an unfortunate necessity to go heavy on feminine signifiers to communicate without any doubt that Stella is a female bird, or people would assume she was male. However, it may have gone a bit far. One friend assumed that all of the other birds present were males. Stella’s female signifiers were so strong that it ended up overshadowing the female signifiers in the other characters; her pinkness drowns out everyone else’s eyelashes. At least she isn’t wearing a bow. It’s Jenga. “Girl Talk” pink Jenga, advertising itself with phrases like “Solid wood blocks are pretty in pink!” I’m sure the product designers meant well, but when you release a special Jenga for girls, you’re saying that regular Jenga is for boys. Fortunately, Rovio didn’t intend this. Blanca Juti, Rovio’s Chief Marketing Officer stated, “Just as I hope people don’t think Star Wars is for boys, I hope they don’t say this is just for girls.” In fact, she takes it a step further. “We want to challenge stereotypes, both on girls – that they only play easy games – and on boys, that they don’t like anything pink. We really want to challenge this, and there is already a bit of a movement around it.” I’m pleasantly surprised by this stance. They intend to challenge stereotypes going both ways! From what I’ve played, the game is certainly about as difficult as your regular Angry Birds game, and I’m having a lot of fun with it. 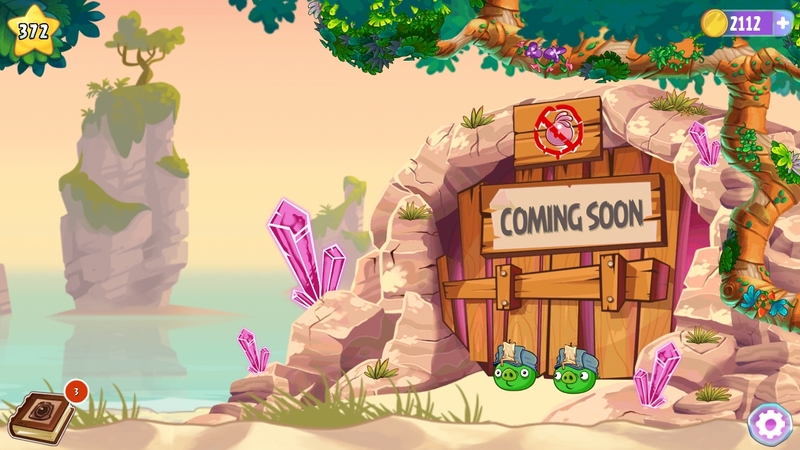 Outside of the main character being pink instead of red, it looks just like any other Angry Birds game, albeit with a tropical flair. The map selection uses flowers to represent levels, but I associated them more with the tropical theme than with being girly. It didn’t even occur to me that they could be read as feminine until I was about to hit “Publish”. Over half of the people who watched the game’s trailer on Facebook are men, so maybe this game will be a force for positive social change. However, I admit I’m not completely certain of that; men and boys are not the same thing. While the trailer has attracted a lot of male attention on Facebook, Facebook’s users are not, primarily, children. I love the pink protagonist, but I’m not sure that a little boy would. If we end up with a scenario where Stella enjoys an adult male audience but not a young male audience, I suppose that would count as an improvement, even though it falls short of my hopes. At the very least, I hope that a boy who isn’t interested in Stella might reconsider if he sees an older relative playing. In spite of all this ambiguity, there’s one element that I feel is a clear step in the right direction. Stella is a powerful heroine of action. 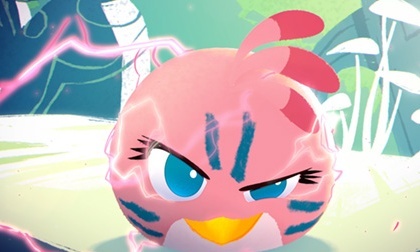 When the Stella character first debuted in Angry Birds Seasons, her special ability was that she could blow bubbles to trap blocks and pigs. Now, she can change her trajectory in mid-flight at a moment’s notice, turning into a ricocheting meteor that smashes her way through physical and social barriers. She’s an active protagonist with energy to burn, and she feels powerful. Sure, she’s pink and girly, but I think that might ultimately work in her favor. She can be a fun and powerful protagonist without having to abandon feminine traits or adopt masculine ones, and if audiences of all ages and genders can embrace that, that would be fantastic. 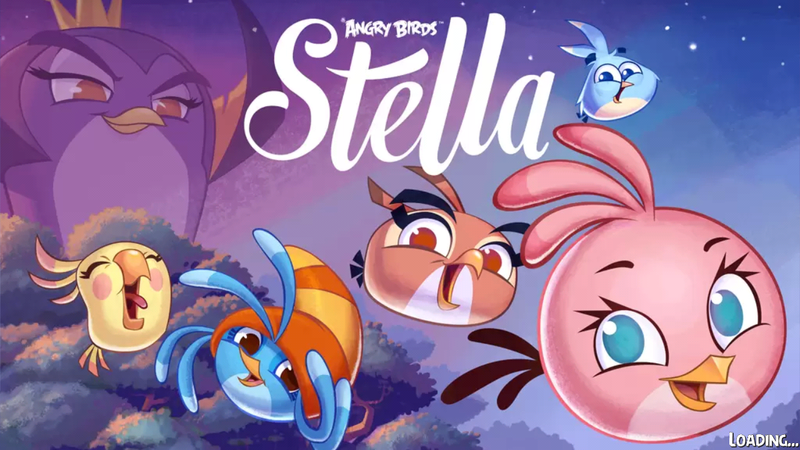 I realize I’ve brought up a lot of points of contention in this post, and I just want to make it clear that I feel that Angry Birds Stella has a lot of positive social potential. It’s a game with a female protagonist who carries power while embracing stereotypical femininity, they’ve created a deliberate link between stereotypical femininity and power, sending a strong message that being a hero is not exclusively a masculine trait. Stella is being welcomed by men, so maybe we’ll see more female protagonists going forward. It’s not perfect; while her signifiers embrace femininity, it might be playing too close to stereotypes, and might also turn off some male gamers. Still, I feel that if a male and female gamers alike can enjoy a popular game with a heroic female protagonist, that’s a great step down the right path. Extra Credits is good and you should watch it. I mentioned before in my post about advertising that the free to play model would benefit tremendously from new revenue streams. The Extra Credits video series just put up a new video voicing all of my concerns far better than I could. Summed up, the aggressive targeting of whales is getting out of hand. Whales certainly have their place, but if games cater exclusively to them, there’s going to be a death spiral. This situation isn’t just bad for those games; it’s bad for the entire free to play industry, which is picking up a pretty bad reputation. Things don’t have to be like this. 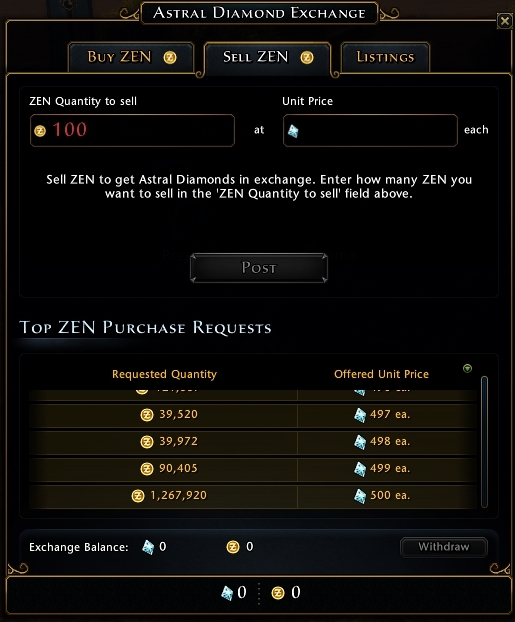 Blizzard, Riot, and Valve are making money through free to play without having to target such a tiny fragment of the population. 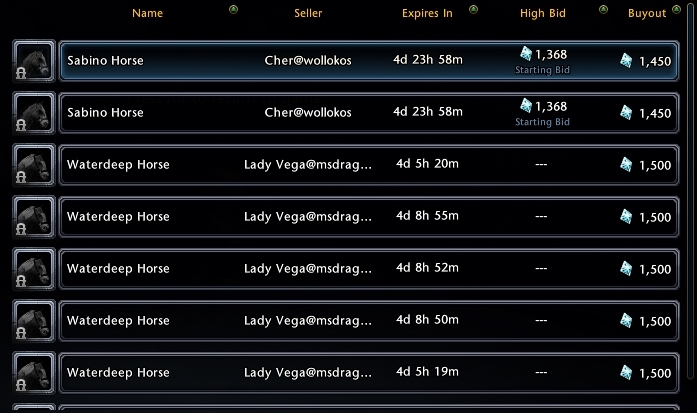 I think we should all consider what is necessary for the free to play industry to remain sustainable. There’s a lot of potential for good here, and it’d be a shame to waste it.